Mazda 808, 818 1972-78 autobook ..
Rover 3 Litre P5 1958-67 autobook ..
Ford Capri 1300 OHV, 1600 OHV 1968-79 autobook..
Ascona, Manta 1975-79 autobook ..
Renault 15, 17 1971-78 (autobook) ..
Ford Thames 10, 12, 15 cwt 1957-65 autobook ..
Workshop Manual: Consul, Zephyr, Zodiac MK 1 & 2 1950-62. Ford Capri 1600 OHC, 2000 OHC 1972-79 autobook..
1100, 1300 handybook: owners handbook for Austin 1100, 1300 Mk1, 2, 3 1963-74, Austin America, 1300GT 1969-74, Austin1100, 1300 Countryman 1966-74, Morris 1100, 1300GT Mk1, 2 1962-71, Morris 1100, 1300 Traveller 1966-73, MG 1100, 1300 Mk1, 2 1962-71, Riley Kestrel 1100, 1300 Mk1, 2 1965-69, Vanden Plas Princess 1100, 1300 1963-74, Wolseley 1100, 1300 Mk1, 2 1965-73. Porsche 911 1974-77 Autobook: Porsche 911, N, S, Targa 1974-77, Porsche 911 Carrera 1974-77. Rover 2000, 2200 1963-77 autobook ..
Datsun 160B, 180B, 610 1972-76 autobook .. Triumph Stag, 1970-76 autobook ..
Ford Consul, Granada 1972-74 autobook ..
Alfa Romeo Giulia, 1750, 2000 1962-74 ..
Fiat 128 1969-74 autobook ..
Peugeot 204 1965-74 autobook .. Triumph 1300, 1500: 1965-73 autobook. Mazda 1500, 1800 1967-73: Workshop Manual. 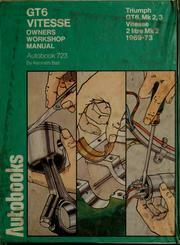 Triumph TR5, TR250, TR6, 1967-73, autobook: workshop manual for the Triumph TR5, TR250, and TR6, 1967-73. Are you sure you want to remove Kenneth Ball from your list?